What Products Do You Want to Sell Online? So you are a merchant who is ready to sell the Next Big Thing over the internet, but you don’t know how to manage the often-fraught process of setting up and running an e-commerce shop. Don’t fret. Ecwid is a free-to-use piece of software that drastically lowers the barrier to entering the lucrative space of e-commerce. It can handle everything from inventory management to promotional sales to simplifying aspects of your shipping and fulfillment. Simply put, it’s the quickest on-ramp to making money by selling online. You have to know what you’re going to sell online before you can actually go about doing so. If you don’t know what to sell with Ecwid, we’ve got plenty of help for you on our where to get ideas for your store blog post. Identify the pain points in your own life, and use them to identify or create a product to sell to others in order to alleviate it for them. Use a social site like Product Hunt to see not only the latest products people are making, but to see early stage ideas that you might be able to perfect. If you want inspiration while watching TV check out Shark Tank in the US or the UK predecessor Dragon’s Den and see what other entrepreneurs are pitching for funding. If you already have an idea but lack the resources to see it through to fruition, then organize a Kickstarter campaign or other crowdfunding campaign to raise the money necessary to get the process going while building out a customer base of backers in the process. Ecwid has over 1.5 million registered users so there is a very good chance we have already had someone be successful in your niche. Ecwid works by letting you create your own fully-featured online store for customers to purchase items directly from you. It grows as your business grows, letting you add new inventory and new features to your store as easily as you can install an app on your smartphone. As your business expands to other storefronts like eBay and Google Shopping, Ecwid’s unique architecture allows your online store to synchronize across these other websites, blogs, or even Facebook pages, all of which can be managed from one control panel through Ecwid. We know that you have choices when it comes to identifying the best way to sell products online. Considering that we have spent a lot of time in making Ecwid the best-possible and most appealing choice, we’re rather biased and want to make sure you choose it to power your e-commerce operations. Ecwid has a low barrier to access, is easy to use both as a shopper and a backend merchant, will let you operate a fully-functioning e-commerce store at no charge, and is entirely customizable to look and work whichever way is best for you. Ecwid’s is platform agnostic so that allows us to work with the CMS that works best for your exact situation rather than trying to fit you into any specific software. Get started selling online today by registering a free Ecwid account in minutes. If a journey of a thousand miles begins with a single step, then your e-commerce adventure begins by claiming your Ecwid account and doing some research on our blog about how other users are making their way in the world by using Ecwid. 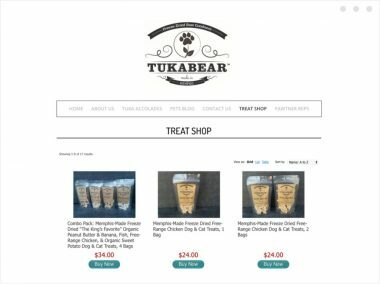 Consider the case of Tukabear Treats, a pet snacks business operated by a Tennessee woman who just recently purchased her second freeze-dryer to make the products that her customers keep buying more rapidly. Her business has not only been a significant supplement to her family’s income, but has also garnered the attention of thousands of Instagram followers likely to convert to paying customers that she can use Ecwid features to easily manage. Because so much of the e-commerce tedium is rather readily managed by Ecwid software, Tukabear staff is free to focus on building a more genuine connection with its customers. Orders ship with all kinds of indications of thoughtfulness, not the least of which being handwritten note that thanks the customer for their purchase. These kinds of things simply don’t happen with Amazon. Find your products to sell online and start building your online store today!